unless you or the person you are buying the gift box for REALLY love smoky teas. The Lapsang Souchong in the Fortnum & Mason Classic World Tea Bag Selection gift box is so strongly fragrant that all the other teas in the box take on its smokiness. Actually, it makes every tea in the cabinet take on a bit of smokiness if you are not careful! I had to move the gift box to its own cabinet, FAR away from all my other teas. It’s very rare that I write about teas in a negative way. And I wanted to stay positive about this Fortnum & Mason gift box, because I received it as a gift, and I don’t want to come across as ungrateful. I am VERY grateful and appreciative for the gift, and that someone thought enough of me to give me a gift. Plus, most of the teas in the set, minus the Lapsong Souchang, are teas that I normally like very much: Darjeeling BOP, Assam Superb, Ceylon Orange Pekoe. On their own, any of these teas are generally wonderful. 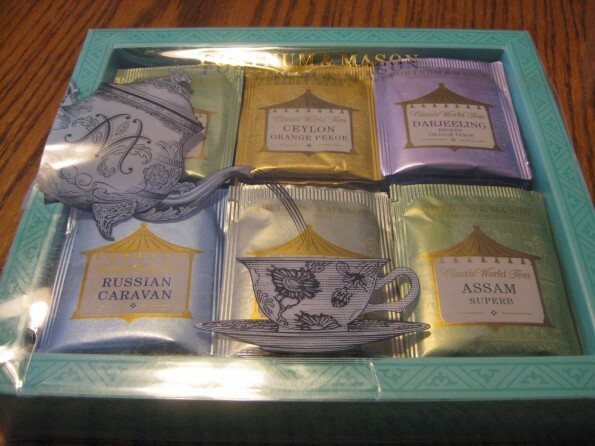 And I will drink all the teas in the gift box…but I will not expect them to taste like anything but smoke. I was lucky enough to also receive some Fortnum & Mason Loose Leaf Darjeeling in a canister, so at least I have an idea of what that should taste like without the smoky addition. Otherwise, I might think that all the teas in this set are supposed to taste like smoke! On the upside, since receiving this gift box, I have started to get over my natural aversion to Lapsang Souchong, and I can now appreciate its unique qualities. It is almost like the experience of sitting around a campfire, distilled into a cup of tea. I love camping, so drinking a cup of Lapsang Souchong is almost like a little mid-day escape. That said, I would never go out of my way to buy Lapsang Souchong or even order a cup or pot of it at a tea shop. I can appreciate it and tolerate it when given it as a gift, but I am still not a fan. However, to each his own. If you love smoky teas, or want to buy a gift for someone who loves smoky teas, then by all means, invest in the Fortnum & Mason Classic World Tea Bag Selection. Otherwise, I recommend passing on this set.